Years before the likes of Al MacInnis and Rob Blake gained fame and fortune with their blistering right-handed slap shots, Philadelphia Flyers defenseman Bob “The Count” Dailey terrorized NHL goaltenders with deadly accurate 100 mile-per-hour blasts from the point. A two-time winner of the Barry Ashbee Trophy as the Flyers’ best defenseman, Dailey possessed a rare combination of imposing size (6’5’’, 220 pounds), remarkable agility and an occasional mean streak that also carried him to a pair of NHL All-Star Game selections and a Vancouver Premier’s Trophy as the Canucks’ best defenseman. With the sole exception of U.S. and Flyers Hall of Fame inductee Mark Howe, Dailey was arguably the best offensive defenseman in franchise history. 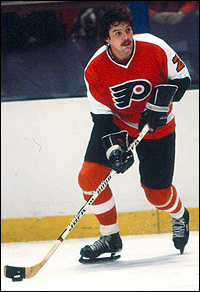 During his Flyers career, Dailey averaged two points for every three games played and recorded a 21-goal season during his first full year in the orange and black. Unfortunately, a series of injuries, including major shoulder and knee injuries, curtailed Dailey’s effectiveness. When reasonably healthy, Dailey was a heavy body checker as well as an offensive force. But he often played at far less than 100-percent, which made his career seem sporadic and inconsistent to those who were unaware of his physical struggles. Even in his All-Star seasons, Dailey was subject to such lofty expectations that he was sometimes branded an underachiever. Dailey’s injury woes culminated with a shattered ankle suffered in November of 1981. The injury ended the Count’s NHL career at the age of 28 – an age most defensemen are hitting the prime of their careers. Robert Scott Dailey was born in Kingston, Ontario, on May 3, 1953. Tall and gangly as an adolescent, Dailey was nevertheless a standout youth hockey and Junior-B player for the Trenton Travelers and Markham Waxers, averaging nearly a goal-per-game as a young defenseman. Dailey attracted the attention of the OHA’s Toronto Marlboroughs and became a regular starter on the Marlies’ blue line at age 17. Dailey’s arrival added depth to a decent blue line that included future NHL tough guy Steve Durbano, WHA pro Ralph Hopiavouri and one-time Detroit Red Wings hopeful Charlie Shaw. Up front, the 1970-71 Marlies had an extremely talented group that included future NHL stars Steve Shutt and Steve Vickers, longtime New York Islanders standout Billy Harris and top Montreal Canadiens draft pick Dave Gardner (who briefly played with Dailey on the Flyers at the end of Gardner’s career). In his second season with the Marlies, Dailey started to assert himself at both ends of the ice, leading all Toronto defensemen with 11 goals and 50 points in 62 regular season games for a first-place team that still had most of its stellar forward group intact. During the Memorial Cup playoffs, Dailey had 10 points (including 3 goals) in 10 games. One of his fellow blueliners on the Marlies, Larry Goodenough, later won a Stanley Cup for the Flyers before being traded to Vancouver for Dailey. The Marlies lost a host of talented players after the 1971-72 season, including Shutt, Gardner and longtime NHL forward George Ferguson. But the team added an equally talented group of newcomers, including a young superstar left wing named Mark Howe, his defenseman brother Marty Howe, future NHL goaltender Mike Palmateer and future World Hockey Association standouts Paulin Bordeleau (who later played for the Vancouver Canucks) and Wayne Dillon (who also suited up with the New York Rangers). Team captain Dailey was the backbone of the Marlies’ blue line. Now standing 6’5’’ and weighing nearly 210 pounds, the 19-year-old emerged as a monster OHA defenseman, racking up 65 points in 60 games to go along with 200 penalty minutes. The Marlies rolled to first place again with an extraordinary 47-7-9 record. Toronto racked up a league-best 416 goals while allowing a league-fewest 199 goals in 63 games. The Marlies steamrolled their way through the Memorial Cup to win junior hockey’s most coveted prize. Dailey was absolute force, blasting home nine goals and 20 points in the postseason. Goaltender Palmateer loved having Dailey on his side during games, but dreaded when the hulking blueliner took target practice during warm-ups. As much as the eccentric, somewhat volatile Palmateer hated being scored on, it was almost better than getting hit by one of Dailey’s scorching shots. The Vancouver Canucks selected Dailey in the first round, ninth overall, of the 1973 NHL Amateur Draft. On the chance the star Marlies defenseman could be lured to the fledgling World Hockey Association instead of the NHL, the Toronto Toros used a fifth round pick in the 1973 WHA Draft to select Dailey. Dailey listened politely to an offer from the Toros. But, as expected, he signed with the Canucks and reported to training camp intent on competing for an NHL job. Dailey’s first two NHL seasons coincided with the Flyers’ Stanley Cup victories. Entering the 1973-74 season, the Canucks were an NHL expansion franchise in their fourth year of existence. Although the team had several promising youngsters on the roster, it had little hope of competing with old guard franchises such as the Montreal Canadiens, New York Rangers and Toronto Maple Leafs in the NHL’s Eastern Division. Dailey’s first NHL coach was Bill McCreary Sr., who lasted just half a season before giving way to Phil Maloney. Although Dailey was still raw defensively – prone to getting himself out of position looking for a big hit or gambling offensively – his potential was obvious. While Andre Dupont was known as Moose to Flyers’ players and fans, Dailey acquired the same affectionate sobriquet in Vancouver. The 20-year-old defenseman started 76 games for the Canucks, scoring seven goals and 24 points to go along with 143 penalty minutes. While Dailey’s minus-32 defensive rating was unsightly, it was all part of the growing process for a young defender on a struggling team that finished with the third-worst record in the NHL. “Moose” and the Canucks showed marked improvement in 1974-75. With the NHL switching from a two-division to a four-division format, Vancouver took first place in the newly christened Smythe Division led by youngsters such as Dailey, Don Lever, Chris Oddleifson, Dennis Ververgaert and Gerry O’Flaherty and veterans like Andre Boudrias and John Gould. Although the Smythe was the weakest of the four divisions, and the Canucks’ 86 points would have been no better than third-place in any other division, the fact the club posted a winning record was impressive. Dailey scored a dozen goals for the Canucks and added 36 helpers for 48 points. Although he was often matched against other teams’ top forwards, he also managed to improve his plus-minus rating by 24. He took fewer bad penalties and trimmed 40 minutes off his penalty totals without sacrificing physical play. At the end of the 1974-75 season season, the 22-year-old Dailey was awarded the Vancouver Premier’s Trophy as the Canucks’ top defenseman. In the playoffs, Vancouver had the misfortune of drawing the mighty Montreal Canadiens in the first round. The Habs won in five games, outscoring the Canucks 20 to nine in the process. But big Bob Dailey was one of the few bright spots for the Canucks in the series, scoring a goal and four points in five games and turning in a yeoman effort as the Canucks shocked Montreal on Forum ice with a 2-1 victory in Game Two. Dailey’s strong play in his second season greatly elevated the expectations for his play to the point that nothing short of NHL All-Star caliber play from the third-year blueliner was acceptable in the eyes of many fans and media members. Unfortunately, injuries limited Dailey to 67 games and while his offensive numbers were strong (15 goals and 39 points to go along with 119 penalty minutes), he was not as consistent at either end of the ice as fans or coach Maloney had hoped to see. The Canucks finished with 81 points in 1975-76, one point behind the Chicago Blackhawks in the re-aligned Smythe Division. Vancouver then played the New York Islanders in a best-of-three mini-series, losing in two straight. Dailey had a goal in one tilt, an assist in the other. While Dailey’s third NHL season fell a bit short of the lofty expectations placed upon him, he had become a fixture in the Vancouver community. He organized the Canucks first softball team that played in a series of summertime charity games. He also showed an entrepreneurial spirit, investing a sizable amount of money in the Severin's entertainment and dining complex in Burnaby, British Columbia. Dailey’s increasingly shaky relationship with Maloney soon took a turn for the worse. The Canucks got off to a poor start and the coach publicly chided the big defenseman for his conditioning and said he’d become lackadaisical in his defensive play to the point that much smaller players were bumping him off the puck. Dailey, who was playing through elbow and groin injuries, chafed at what he felt was unwarranted criticism. Dailey slumped on the ice, scoring just four goals and 20 points – to go along with a minus-16 rating – through the first 44 games of the 1976-77 season. For the first time, the once-untouchable Dailey’s name surfaced in numerous trade rumors. The soon-to-be 24 year old defenseman then let it be known through his agent, Alan Eagleson, that he wouldn’t mind moving on from Vancouver. On January 11, 1977, Flyers general manager Keith Allen pulled off one of the many great trades for Philadelphia that he was known – some outside Philly would say infamous – for. Vancouver sent Dailey to the Flyers in exchange for his former Marlies teammate, Larry Goodenough, and tough guy defenseman Jack McIlhargey. Dailey was thrilled. He wasted no time getting on a plane to join the three-time Cup finalist Flyers for a road game in Atlanta. Dailey wasted no time paying dividends for the Flyers. In his first game, the Flyers trailed 4-3 heading into the final minute of play. With just 38 seconds left in regulation and goalie Bernie Parent pulled for an extra attacker, Flyers center Mel Bridgman fed Dailey at the point. The big defender unleashed a tracer of a slap shot that Flames goalie Phil Myre somehow managed to block but produced a juicy rebound that Reggie Leach promptly deposited into the net. Just like that, the Flyers came away with a point on the road (there was no overtime played in those days). On his first day with the Flyers, Dailey also acquired a new nickname as soon as he walked into the locker room. Andre “Moose” Dupont strode up to his new teammate, wagging his finger. “There’s only one Moose here and that’s me,” the beefy defenseman said in his heavy Quebec accent. Noticing the towering Dailey had slung his suit jacket over his shoulders as he unbuttoned the sleeves of his dress shirt, Dupont said Dailey looked like “The Count” from Sesame Street. Considering the Flyers already had a “Big Bird” (Don Saleski) on the club, it seemed only fitting they should have a Count, too, especially because the team was counting on big things from their new acquisition. The nickname stuck for the rest of Dailey’s career. The following week, Pittsburgh Penguins goalie Dunc Wilson became the first opposing goalie to fall victim to something that soon became a familiar sight. Dailey took a long stride in from the point and receiving a perfect pass from captain Bobby Clarke, blasted a scorcher that simply overpowered the Pittsburgh netminder. The Flyers won, 5-2. A few days later, in an almost identical sequence, Clarke fed Dailey for a power play goal in 9-3 rout of the Washington Capitals. In 32 regular season games for the Flyers after the trade, Dailey had five goals, 19 points and plus-16 rating at even strength. He accomplished the feat despite playing through a ribcage problem that briefly knocked him out of action. Philadelphia took first place in the Patrick Division and Campbell Conference with 112 points – the second-best record in the NHL. There was a pall over the 1977 playoffs for the Flyers, as the players learned that assistant coach and former player Barry Ashbee was dying from leukemia. Philadelphia dropped the first two games of its opening round series against Toronto before rallying to win four straight games. Dailey played a critical role in the series victory, torturing former junior teammate Mike Palmateer with 10 points (including a pair of goals) and 18 shots on goal in the six-game series. In the second round, the Flyers ran out of steam against the Boston Bruins, dropping three consecutive one-goal decisions (4-3, 5-4 and 2-1) before getting whitewashed 3-0. Dailey had two goals and three points in the four-game series, including the lone tally in the 2-1 loss. The grief over Ashbee’s death on May 11, 1977 and the disappointment of getting swept by the Bruins overshadowed the fact that Dailey tied forward Rick MacLeish for the most playoff points on the club that year with four goals and 13 points in 10 games. Likewise, the Flyers’ slip to second place in the Patrick Division in 1977-78 and five-game defeat by Boston in the Stanley Cup semifinals rendered Dailey’s extraordinary first full season in Philadelphia little more than a footnote in team history. The season is best remembered as the swan song for the Broad Street Bullies. That season, Dailey stayed reasonably healthy and set club records – later broken by Howe – for the most goals (21) and points (57) by a defenseman in a single season. Dailey also posted a remarkable plus-45 rating and had cut his penalty minutes to 62. 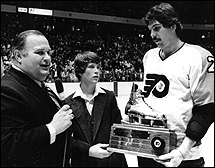 He was a shoo-in for the NHL All-Star game and won the newly dubbed Barry Ashbee Trophy as the Flyers’ top defenseman. “When Dailey fires the puck, it leaves a vapor trail. You just hope the shot stays low,” said teammate Gary Dornhoefer, who made his living by parking himself in front of the net. Fortunately for Dornhoefer and the other Flyers, Dailey’s shot attempts from the point were usually on target. In 76 games played in 1977-78, “The Count” compiled a remarkable 211 shots on goal. He also played in all game situations and found the mark on a pair of shorthanded tallies as well as five power play markers among his 21 goals. On the few occasions that one of Dailey’s shots missed the mark and struck the boards or the glass behind the net, the explosion-like sound it produced often caused fans seated behind the net to scatter or duck for cover. When one of his shots clanged off the goal post or crossbar, the reverberation could be heard from anywhere in the Spectrum. In the 1978 Stanley Cup playoffs, Dailey got off to a great start. He was a force in the mini-series victory over the Colorado Rockies. In the first game, Dailey crushed Rockies forward Andy Spruce with a bone-rattling open ice check that earned him a standing ovation from the Spectrum crowd. In the second round of the playoffs, Dailey garnered points in four of the five games the Flyers played against the Buffalo Sabres. Dailey had an up-and-down semifinals series against Boston. His most memorable moment came in the pivotal second game of the series. With the Bruins having prevailed on home ice in the opener, the Flyers could ill afford to return home trailing two games to none. Boston grabbed a 5-1 lead early in the second period and seemed poised to cruise to victory. But the Count and company weren’t ready to give up. Dailey’s goal with 40 seconds left in the second period helped spur the team to a four-goal comeback that also saw Bill Barber, Rick MacLeish and, finally, Bobby Clarke score to tie the game, 5-5, in the third period. Unfortunately for the Flyers, Boston scored twice late in the third period to win the game, 7-5. The Bruins prevailed in the series in five games. The 1978-79 season marked the beginning of a transitional era for the Flyers. Head coach Fred Shero left to take head coach and general manager duties with the rival New York Rangers. After a brief stint behind the Flyers’ bench, new coach Bob McCammon was re-assigned to the AHL Maine Mariners, while Mariners coach Pat Quinn was promoted to the Flyers. Meanwhile, many of the other familiar faces from the Stanley Cup teams were already gone, and Bernie Parent was forced to retire midway through the season after suffering a career-ending eye injury. In the midst of this upheaval, the Flyers relied heavily on Dailey to backbone the team’s defense and boost the power play. Unfortunately, the big defenseman’s body refused to cooperate. Shoulder, hip and knee problems kept Dailey out of 10 games during the season and his play was inconsistent when he was in the lineup. Most notably, Dailey’s physical play and mobility tailed off. A fan favorite one season earlier, Dailey sometimes heard boos from the Spectrum crowd during the 1978-79 campaign. His goal scoring output dipped from 21 to nine and he tallied just a single power play goal the entire season. Dailey’s play that year was far from the disaster it was sometimes painted to be. His nine goals, 39 points and plus-21 rating would have been a great season by most defensemen’s standards, especially in light of his physical struggles. In the Flyers’ short playoff run, he had a goal and three points in eight games. Shero’s Rangers downed the Flyers in the second round of the playoffs. Dailey’s injury woes continued but he was right about the quality of the team. To the surprise of the entire NHL, the supposedly retooling Flyers set a North American professional sports record with a 35-game unbeaten streak and cruised to the best record in the league. Unfortunately, Dailey was plagued by a major shoulder problem that, by year’s end, left him barely able to lift him arm. Dailey missed 12 consecutive games during the 35-game unbeaten run and also had to sit out of seven games in March. When he was in the lineup, “The Count” was outstanding. Dailey had 13 goals and 39 points in just 69 games, to go along with a plus-30 defensive rating. His strong production enabled him to win his second Barry Ashbee Trophy despite all the time he missed during the season. It was in the playoffs, however, where Dailey showed his true worth to the Flyers. The big blueliner was a crucial cog in the Flyers’ run to the Stanley Cup Finals. Despite needing shoulder surgery, he racked up 17 points in 19 games and cranked up his physical play when it was needed. During the Stanley Cup Finals against the New York Islanders, Dailey’s three-point effort in game two salvaged a home-ice split after the Islanders nicked the Flyers, 4-3, in the opener, Later, in the fateful sixth game best known for linesman Leon Stickle’s blown offside call in the first period, Dailey scored early in the third period to give the team a chance to come back after falling behind 4-2 in the second period. Five minutes later, a John Paddock goal forced overtime. But it all went for naught. Seven minutes into overtime, Dailey was out on the ice when the Flyers defenders got their coverage mixed up. Bob Nystrom skated in unimpeded to receive a pass from Lorne Henning and score the goal that won the game and the Stanley Cup for the Islanders. Dailey, who watched in horror as the sequence unfolded, couldn’t bear to watch the New York players celebrating. He stared glumly at the ice – the pain in his shoulder was nothing compared to the pain in his heart. The Flyers’ magical, but ultimately heartbreaking 1979-80 season marked the last time Bob Dailey was able to play anything close to his best hockey. The following season, chronic right knee problems – which ultimately led to postseason surgery – kept “The Count” out of eight games in November, two games in January and 17 of the final 18 games of the regular season. Nevertheless, Dailey earned a selection to the NHL All-Star game largely as a result of posting 18 points (including three goals) in his first 15 games played. For the season, he had seven goals, 38 points and a plus-eight rating in 56 games played. Dailey also showed some of the mean streak he was known for early in his career by posting 141 penalty minutes, the most he’d compiled since his rookie season and the first time in five seasons that he hit triple digits. Despite his ailing knee, Dailey suited up in the final game of the regular season and gritted his way through the playoffs, as the Flyers lost in a seven-game first round series to the Calgary Flames, who were captained by future Flyer Brad Marsh. On July 28, 1981, Dailey underwent surgery to repair torn ligaments in his right knee. He rehabbed through the summer and was in Pat Quinn’s starting lineup for opening night of the 1981-82 season. The Flyers got off to a tremendous start early in the season, sporting a gaudy 8-1-1 record through the first 10 games. After an ugly 8-4 loss at the Spectrum to Dailey’s old team, the Canucks, the Flyers headed to the Aud in Buffalo. Dailey, who had scored in the Canucks game, had six points and a plus-five rating heading into Buffalo. With the Flyers’ trailing the Sabres 4-1 in the second period, Dailey raced Buffalo forward Tony McKegney for an icing touch up. Dailey never made it. Bumped from behind by McKegney, Dailey’s skate got caught in a rut in the ice and he fell backwards into the boards, shattering both his tibula and fibula. “The ankle was busted on both sides. 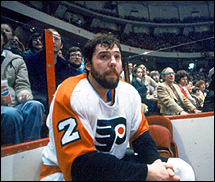 The bones were in a hundred pieces,” he recalled in The Greatest Players and Moments of the Philadelphia Flyers. Dailey was carried off the ice on a stretcher and rushed to a local hospital. In agony and depressed about what he already knew was at best going to be a season-ending injury, the 28-year-old hockey player got a dose of perspective while he was in the E.R. Returning to Philadelphia, Dailey underwent surgery at the University of Pennsylvania Hospital. Flyers’ orthopedic surgeon Dr. Joseph Torg inserted two long screws and one pin into Dailey’s leg. Without Dailey, the Flyers lack of depth on the blue line was exposed. The team went into a tailspin, losing nine of the next 11 games. Dailey’s absence hastened a trade with Calgary, sending Flyers captain Mel Bridgman to the Flames in exchange for defenseman Brad Marsh, the Flames’ captain. Doctors told Dailey that there was a good chance his career was over. Not yet ready to accept this possibility, the player tried to skate in March of 1982. With the Flyers foundering, Quinn was fired midway through the season and replaced by the same man he’d succeeded, Bob McCammon. In the playoffs, the team lost to the Rangers in a best-of-five series. On August 24, 1982, Bob Dailey officially announced his retirement from hockey. His bad leg and foot simply wouldn’t allow him to take to the ice. For the next three seasons, the Flyers carried on while Dailey wondered what might have been possible if he stayed healthy. In 1984-85, the Flyers returned to the Stanley Cup Finals. Dailey’s former Marlies’ teammate, Mark Howe, was the backbone of the rebuilt blue line. The 32-year-old Dailey was hungry to play hockey again. The Flyers granted Dailey access to work out on team facilities, and train under the auspices of Pat Croce (then the club’s physical therapist). Dailey, whose prior training habits were decidedly old-school, got into the best shape he’d been in for many years. His ankle felt strong, he thought. The Flyers signed Dailey to a minor league contract with their Hershey Bears farm team, enabling him to take the next step in his comeback attempt. He joined the club in March of 1986. But once Dailey got into game action, it was clear he could no longer play professionally. The pace of the game, even at the AHL level, was too fast for him to keep up with. While his hockey instincts remained intact, his body wouldn’t get him where he needed to go. After five games with the Bears, Dailey called off the comeback attempt. He retired again, this time for good. Dailey remained in the Philadelphia area after his retirement, and served as a board member of the Flyers Alumni association. While his name is infrequently mentioned among the top players ever to wear the orange and black, it is only because he was forced to retire so young. If it weren’t for a run of bad luck with injuries Bob “the Count” Dailey could have challenged the likes of Mark Howe, Eric Desjardins and Jimmy Watson in the pantheon of great Flyers defensemen of the past.